We are all dreaming of warmer times especially with this snowy weather we've got this week, I'm so over the cold and I'm dreaming of festival season and warmer months. Who wants to sit in beer gardens, go to the beach, have BBQ's, party at festivals and just hang out with friends in the lighter evenings? I sure do and my wardrobe is so ready for some warmth too. 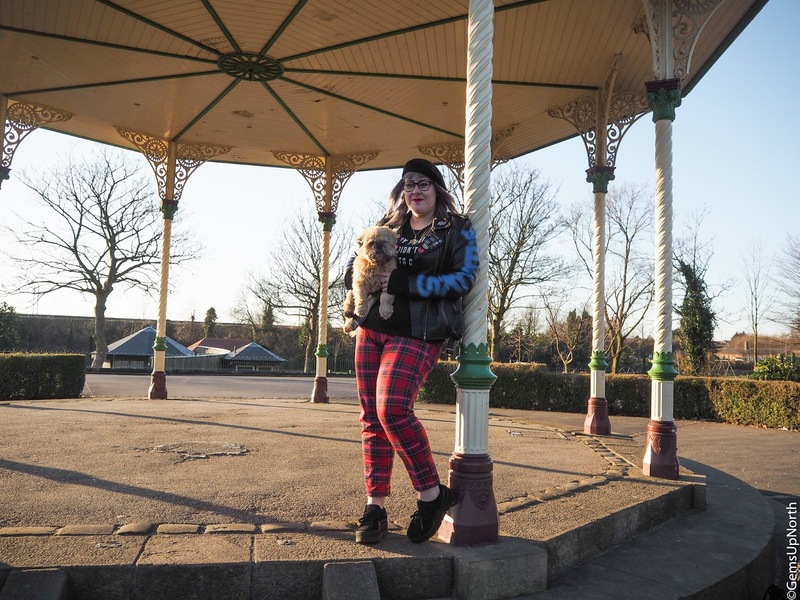 Now we've got the lighter evenings coming back and us bloggers are loving to the extra daylight, I went out on Sunday when it wasn't snowing and was a little bit warmer than its been the rest of the week. 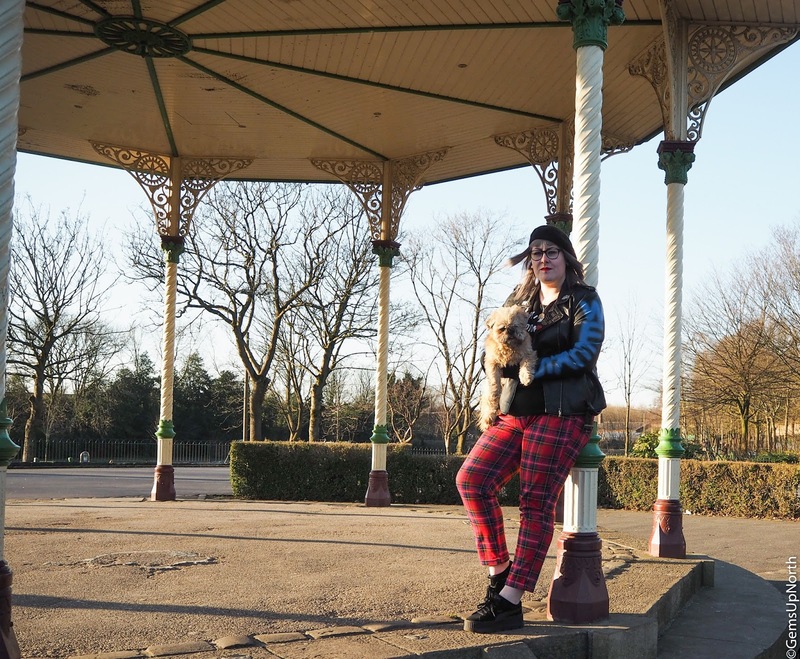 I dragged my friends out with me and brought my best friends dogs along for the shoot too. I wanted to kick start my fashion posts for the year and set a routine to go out shooting more, I wanna get my confidence up and be smashing fashion posts out a few times a month. We headed to the park and grabbed an ice cream first in the cafe, the cafe is also dog friendly so my friend got the doggos an ice cream too; can't leave them out can we. I'd spent the morning trying to put an outfit together but running late and the fact it was Sunday it didn't exactly go to plan... 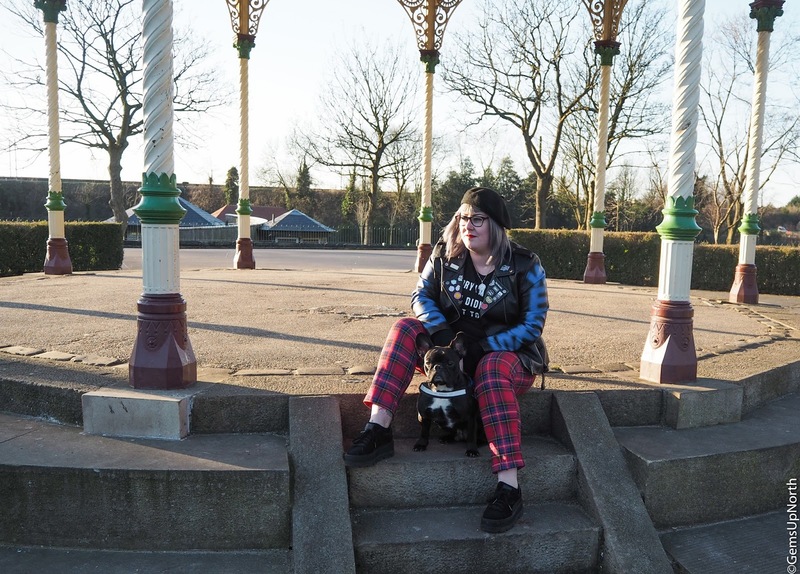 I did however put on my new Tartan pants which I got for just £1.00! Yes one whole English pound, thanks Primark! To be honest I don't really know why they was a pound but my store only had this one pair, in my size so maybe they was a return from a bigger store; still for a quid I was buzzing! 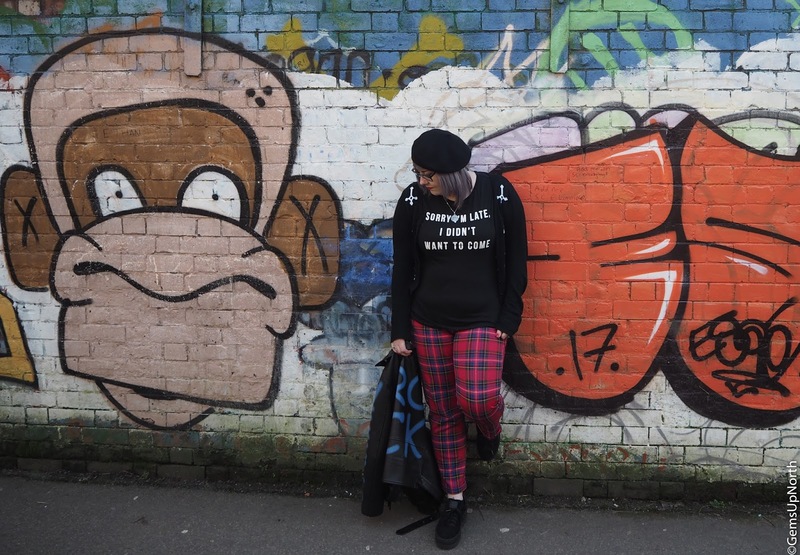 I paired the tartan with a basic slogan tee also from Primark and since I was late to meeting my friends it made for a perfect excuse (jokes). This tee was also a bargain at only £2.50, they have some awesome basic tee's in at the moment, I always have a gander when I go into store. 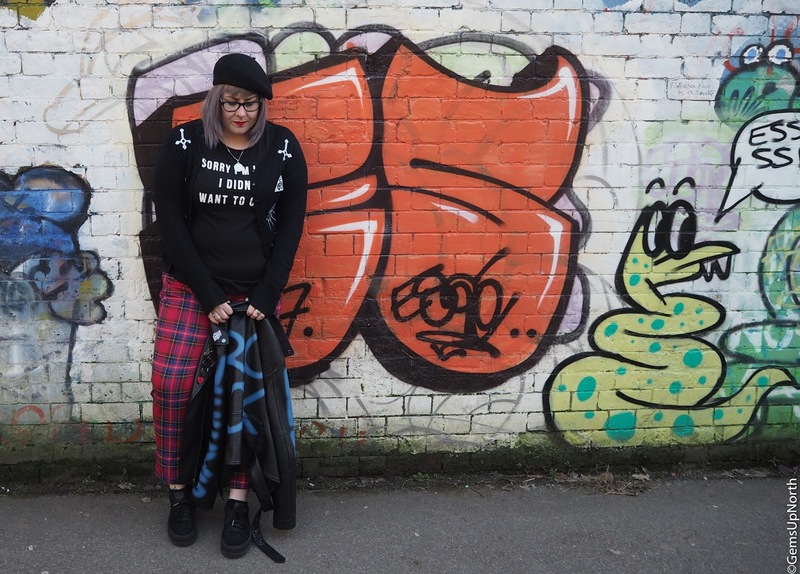 After being at London Edge last month I've been searching for a beret and I found some awesomely cheap ones on eBay, at around £2.49 each I bought a black, red and grey one; I can't believe how comfy they are to wear and they are so on trend right now! Of course I still needed a coat on Sunday even though it was a little warmer so I grabbed my faithful faux leather jacket that I practically live in during spring to autumn. This was another Primark bargain from ages ago, I'd had my eyes on it from when it first hit the Manchester store but couldn't afford it but thankfully waiting a little bit meant it went into the sale; I picked it up for just £10.00! Every time I wear it people always compliment me on it and say they can't believe it's from Primark. Under my jacket for warmth I added one of my Jawbreaker cardigans, I've become a big fan of Jawbreaker after finding out they have my size; Grin in Liverpool stock Jawbreaker so I managed to get this cardi for £9.99 which I thought was a decent price. The only thing I was wearing that wasn't Primark was my Fenty X Puma's that I got for Christmas, I was so shocked and pleased when I opened these on Xmas day, I hate to use the saying but "the boy did good". They are super comfy, have an alternative look to them with the creeper style sole and can be worn with so many outfits. 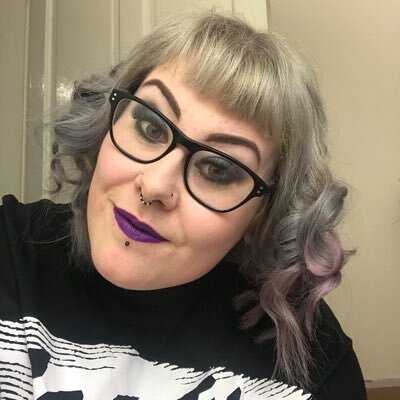 My makeup of the day was kept simple with a smokey eye using my UD Smokey palette and a red lip using Lola Makeup matte lipstick and liner (check back this week for a review on Lola Makeup). 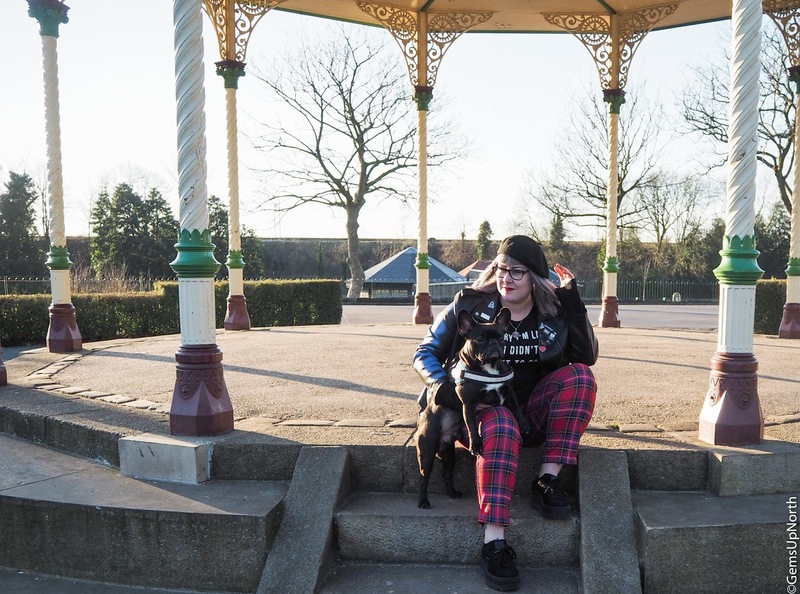 This was probably the most thrown together outfit, shoot plan and dogs aren't that easy to work with, trust me but it was good to get out and shoot with the help of my friends. I really need to do this more, I've got loads of outfits actually planned and I've been location spotting in Manchester. So what's your plans for Spring? 'Check' you out! I love a good tartan print and you've done so well with all these bargains...! 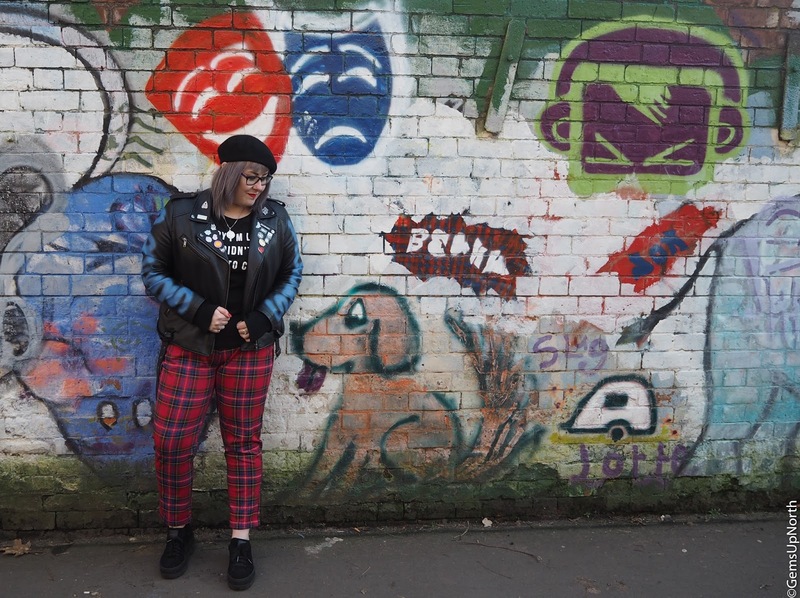 love the tartan pants and how you styled it! .